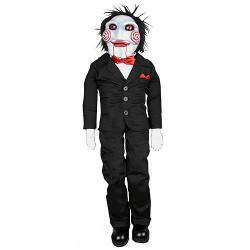 Description Of Item: Saw is a 2004 thriller / horror movie, directed by James Wan and co-written by Wan and Leigh Whannell. The movie took only 18 days to film and was first shown at the Sundance Film Festival in January 2004 and saw an international release later that year on October 29. The film was originally rated NC-17 for strong graphic violence. It has since spawned two sequels.